Burst Pipe by Kevin Ginnings Plumbing Service Inc. 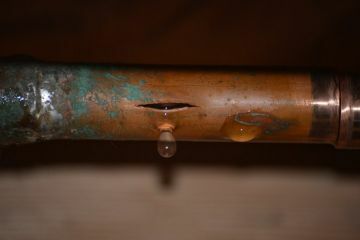 Burst Pipes by Kevin Ginnings Plumbing Service Inc. If you have experienced a burst pipe in your home or place of business, call the experts at Kevin Ginnings Plumbing Service Inc. today. We have been repairing burst pipes in the area since 1985 and are well-equipped to remedy yours as well. When you call (816) 832-4322 for a free quote to fix your burst pipe, we’ll find a convenient time to arrive to your property and provide a quick quote. The expression “Time is money” has never been more relevant. The longer it takes to stop the leaking water, the greater the damages. Call Kevin Ginnings Plumbing Service Inc. ASAP to fix your burst pipes! First and foremost, time is critical. You need a company that will arrive to the scene promptly and contain the problem. If you have had a pipe burst, first turn off your water supply, then call (816) 832-4322 for a speedy assessment and quote. We’ll determine the cause and the extent of the damage and quickly stop any water from leaking from the pipes. Next, we’ll thaw all pipes and check for damages. Any repairs or replacements will be made. Last, we’ll be sure to make suggestions on how to best insulate your piping to avoid pipes freezing in the future. Pipes can also burst from blockages caused over time. Contaminants cling to the insides of pipes, narrowing them and eventually clogging them completely. When pipes become clogged, the pressure inside builds, until eventually they burst, spewing water in your floor boards, your walls, and other damaging areas. If you’ve experienced a burst pipe, first turn off all water. Then call Kevin Ginnings Plumbing Service Inc. at (816) 832-4322 for fast action to remedy the situation. We’ll determine the source of the problem, and identify other pipes that may be compromised. Portions of the pipe will be replaced as needed.